The LG 47LMG860 has the same new look as the models that aren't Google TV enabled. The ultra slim 5mm bezel might as well not even be there giving the television a smooth, single pane of glass look that is among our favorite looks for modern televisions. The LMG860 series will impress friends and family even when it isn't turned on. The Google TV dashboard on the LG 47LMG860. Google TV is included along with the normal Smart TV suite. 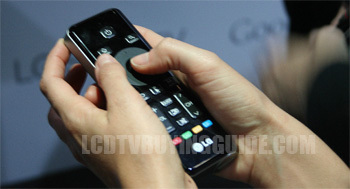 The LG 47LMG860 also contains the new Google TV options in addition to the normal LG Smart TV options. This allows access to the Android TV Apps marketplace as well as all the services that are available there. Navigation can either be accomplished by LG's dashboard or through a special Magic Remote (even more special than the normal Magic Remote) that has a QWERTY enabled feature added. 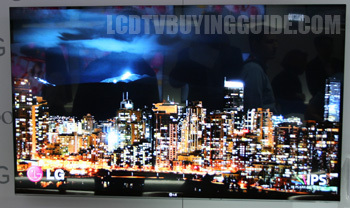 The 47LM8G60 works with LG's new Dual Play system. With Dual Play 2 gamers playing on the same TV are no longer forced to suffer split screen. Looking at only half the screen and possibly even having the picture cut can ruin the experience in many games and Dual Play cures it. Using the Cinema 3D system both players games are projected onto the full screen at the same time and each player wears a different pair of polarized glasses so they only see their own game on the full TV screen.